Butterball® feels there is a bit of Turketarian in everyone. I have joined the Turketarian movement and you can too! Just following this link: Join the Turketarian Movement and discover your inner Turketarian. I found out I am a Healthy Hero (I eat turkey as part of a healthy lifestyle.) No surprise there! By joining the movement, you will also have access to a great FREE mobile app for turkey recipes and be able to grab some great money saving coupons! Who doesn't like to eat healthy AND save money? Turkey is a great protein option for those of us concerned with health and fitness. Turkey is naturally low in fat without the skin, containing only 1 gram of fat per ounce of flesh. A 5-ounce serving provides almost half of the recommended daily allowance of folic acid, and is a good source of vitamins B, B1,B6, zinc and potassium. Most importantly, TURKEY TASTES GREAT!! Today, so many turkey products are available for purchase...From whole birds, to sausages, to ground meat, to bacon, to deli meats...and the ways you can incorporate turkey into your everyday meal plans are almost endless. When it comes to variety, Butterball® has got you covered! Click HERE to see all that Butterball® has to offer! One turkey item, that is almost always in my freezer is turkey smoked sausage. Butterball® makes a Smoked Turkey Dinner Sausage that is lower in fat and calories than smoked sausages made from beef and/or pork but is every bit as delicious. I only made a few changes to adapt it for my family. I substituted the eggs for fat free egg product (ie Eggbeaters®), reduced the oil, and substituted yellow onion for green (because that is what I had on hand). 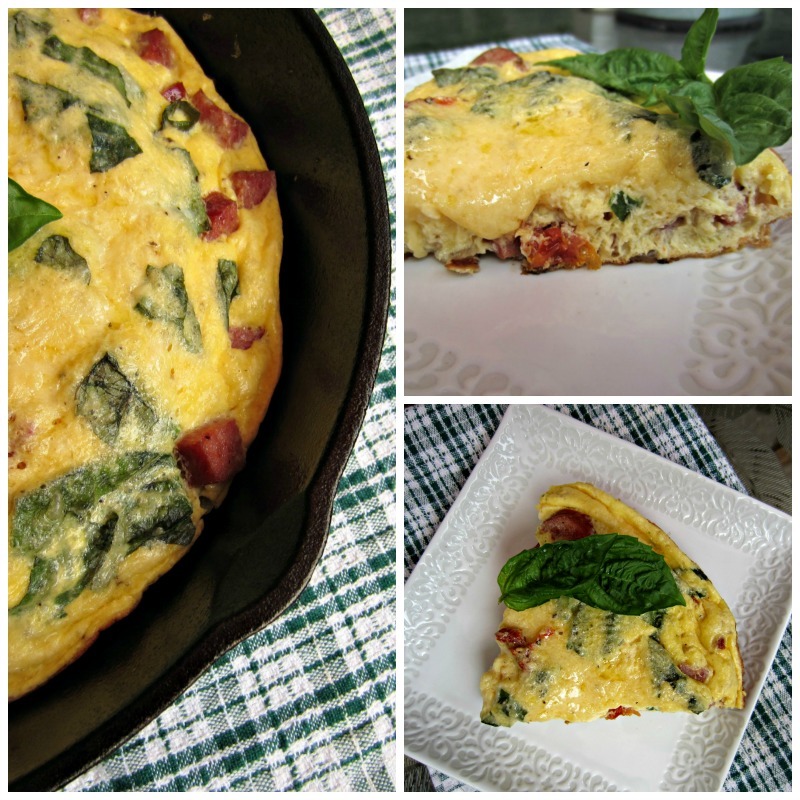 I served this beautiful frittata for breakfast, but this dish would make an awesome dinner or lunch as well. This frittata is full of flavor and guess what? No one in my family even knew I used fat free egg product! What takes this frittata over the top in flavor, is the combination of the turkey smoked sausage, sun-dried tomatoes and the fresh basil. If you can't get fresh basil, I think fresh spinach would be a suitable substitute, but it would definitely change the flavor. To help keep the calories in check I used the dry packed sun-dried tomatoes, and not the ones packed in oil. So why not join me and give "Turkey Tuesdays" a try in your house too? 2. Heat an oven-proof 10"skillet over med heat with olive oil. Add in the sausage and onion and cook until onion is translucent and the onion and sausage begin to brown. About 5 minutes. 6. Let frittata cool for about 5 minutes before cutting it into 8 wedges. * Garnish with additional basil, if desired. Serve warm. *Traditionally, frittatas are supposed to be inverted onto a serving platter before serving, but I don't like to do that. I prefer to serve it from the pan. After a slow start this year, my patio basil is finally doing fantastic. I was happy to find a recipe to use some of it up in. 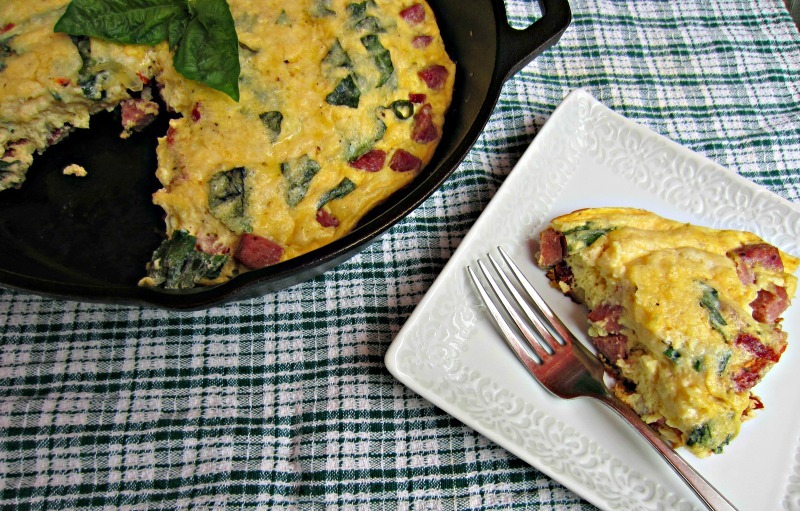 The flavors in this frittata are amazing, especially if you love basil and sun-dried tomatoes. The turkey sausage compliments the flavors perfectly. Be sure to visit the Butterball® site and take the quiz to find out what type of Turketarian you are! Then leave me a comment here and let me know what you got! I too am a fan of turkey. I just happen to also have some basil to use up. This may be on rotation this week, thanks Renee! Oh, it's so pretty and the flavors sound great together! Rock on with your turketarian self! Yes indeed! Rock on! Love turkey for so many reasons! Fresh basil makes such a difference! I bought an organic basil plant earlier this summer and it's been growing well in my kitchen near a window! I love being able so snip of a little whenever I need it. I've never had success with basil indoors, but pot it outside in the spring/summer and hope the first frost takes it's time coming! I love it! I forgot to mention that I like the new look of your blog! It's so fresh and clean cleaning. Great job! Ah thanks Tami! I forgot to mention the new look in the post. My son and I did it on photoshop. He's quite talented! Like the new layout! It looks great!! This looks so yum! I'm all about eggs all day long. We love to grill turkey breasts all summer - not just near Thanksgiving. Thanks for the recipe Renee - have a great weekend!